If you want to have a head start on your adventures in Destiny 2, you might want to think about getting in a pre-order. 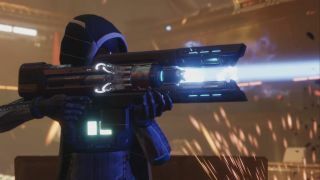 While pre-order bonuses are typically the realm of vanity items or minor boosts, putting some money down early on Destiny 2 will net you an Exotic trace rifle called Coldheart. What's a trace rifle, you ask? A new type of gun introduced in Destiny 2, I answer. As opposed to most of Destiny 2's guns which go "bang bang," the trace rifle is more of a "bwaaaaahm". It fires a steady laser beam instead of bullets, is what I'm saying. Despite the name, Coldheart does not fire a new, icy element. It deals Arc damage and is equipped in your energy weapon slot. In a video featurette with IGN, Bungie said that, as of right now, it's the only trace rifle in the game. I'm… not sure how I feel about this. It took me a long time to get my first Exotic in vanilla Destiny, so unless Bungie is making its most powerful weapons available to everyone much faster this time (or makes you wait to actually obtain it), Coldheart feels like a leg up for those willing to pay ahead of release. If you don't pre-order, you can still get your own Coldheart - but you'll have to wait until December. Did you check out the Destiny 2 beta while it was available? Don't feel bad if not - GamesRadar's own Lucas Sullivan was so excited he purposefully skipped participating.